Wallets are the quintessential tool for your cryptocurrency endeavors. Knowing their importance, it can really make choosing a wallet difficult. Especially considering just how many options there are these days. Throw in some confusion about the differences each wallet boasts in features, and you’ve got a difficult decision on your hands. But we’re not here to evaluate every wallet today. This article is about just one. Electrum, in particular. As it’s stood out as a leading contender for being one of the most used wallets since 2011, we wanted to find out why that is. And if it really does live up to the hype. If that’s something that you’re wondering too, or if you just want to learn more about it, read on. 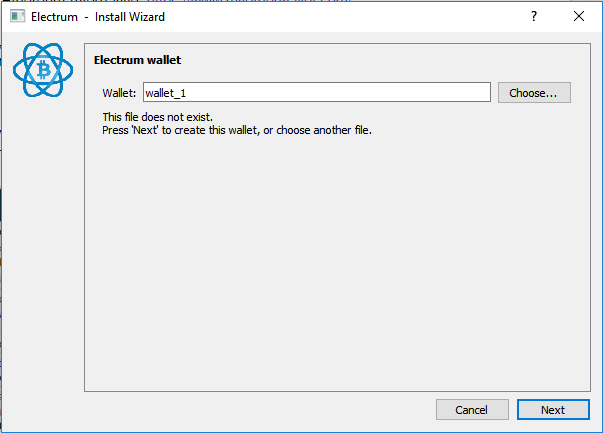 We’re about to conduct an Electrum wallet review, complete with a full guide. 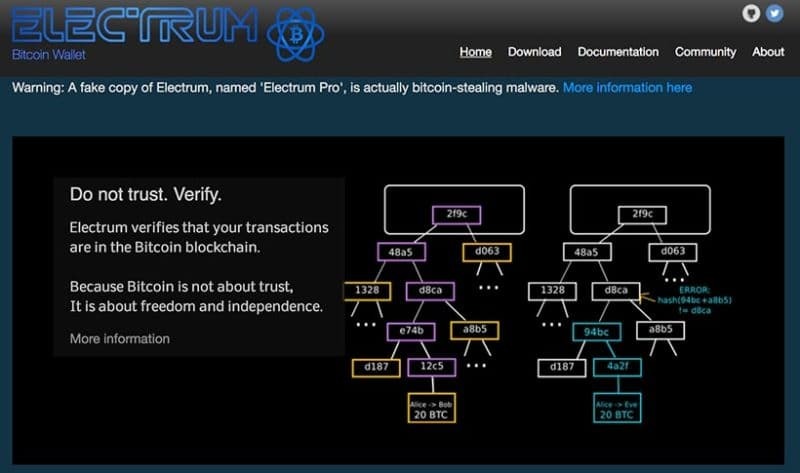 1 What feature makes Electrum stand out? 2 What else makes Electrum great? 3 What lets Electrum down? What feature makes Electrum stand out? There are a number of features that make Electrum a great pick. However, there’s one feature above all others that makes it a cut above a lot of other wallets. That feature is, quite simply, the fact that you do not have to download the entire blockchain to use Electrum wallets. Unlike some other wallets, for example Bitcoin Core, Electrum is what’s called a lightweight wallet. Meaning it relies on other wallets/nodes (with the full blockchain) to verify the transactions are in line with the blockchain. What does this mean for you as a user of the wallet? Very little besides saved hard drive space. There’s no inherent risk or detriment to using a lightweight wallet if all you plan to do is use it to send and receive coins. It’s that simple. However, for more advanced users – a full blockchain wallet is recommended. What else makes Electrum great? Ok, it’s a lightweight wallet. That’s great but it doesn’t inherently make it a must-pick wallet. There are many other features that we’re here to explore as well though. Let’s get into it. If you lose your wallet data, with other wallets, that’s usually pretty much it. There’s very little forgiveness, and you have to accept that your wallet (and its contents) is gone. However, that’s not the case with Electrum. 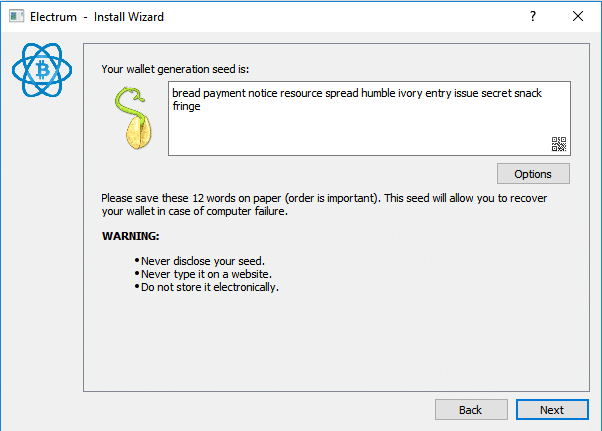 Electrum provides you with a series of ‘random’ words that – when entered into its wallet restoration page – will get you back into your wallet. It’s as simple as that. And as secure as a Bitcoin private key, as the seed possesses 132 bits of entropy. 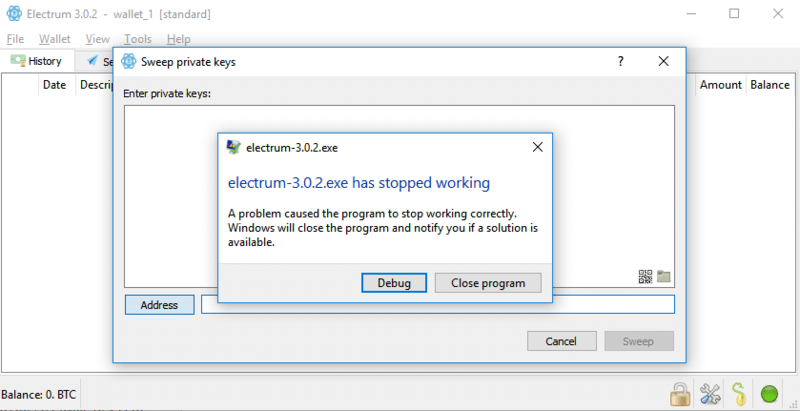 Electrum does not send private keys to the servers it uses. Meaning your privacy is not being risked because you’ve chosen to use a lightweight client. Not only that, but it uses SPV (Simple Payment Verification) to verify any information it receives from its servers. Your seed and private keys are encrypted using AES-256-CBC. This is the standard that government bodies have set for their ‘top secret’ data to be encrypted with. So, your coins are theoretically encrypted as securely as your country’s secrets. If that’s any reassurance. That’s not all though. 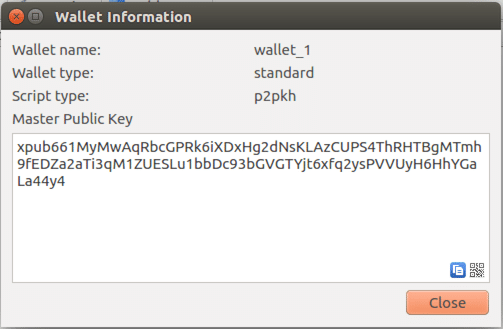 it also has wallet encryption on by default (requiring a password to access your wallets). And despite saving the wallet on the disc, the password doesn’t have to be saved alongside it as Electrum uses asymmetric encryption. 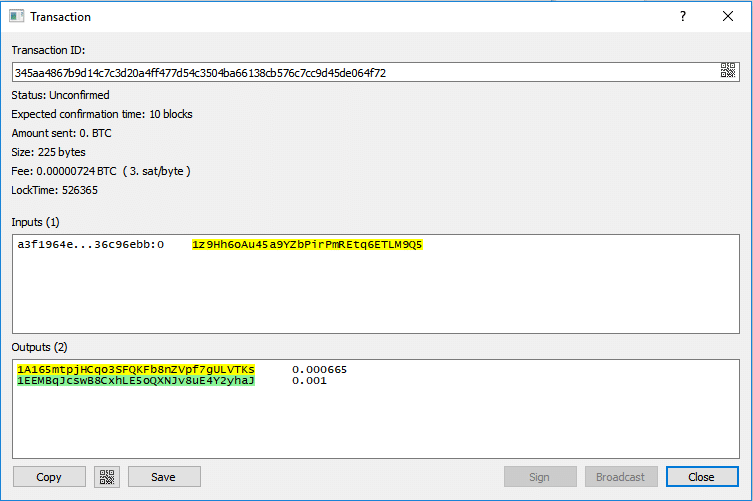 Sweeping private keys simply means to send all bitcoins the keys control to a destination address (your wallet). The private keys do not become a part of your wallet, but all of the contents do get sent to your wallet. Simply enter the private keys, follow the prompts and don’t change the address field! This is about the next best thing, besides actually importing wallet data. Despite being reliant on the Electrum servers, there’s never any downtime. Even if one server was to go down, they have many others in place. Meaning you can access your funds whenever you need to – even though it’s a lightweight client. This is one functionality that other lightweight competitors tend to be missing. So it’s nice to know they have redundancies in place, to ensure your coins are never inaccessible. 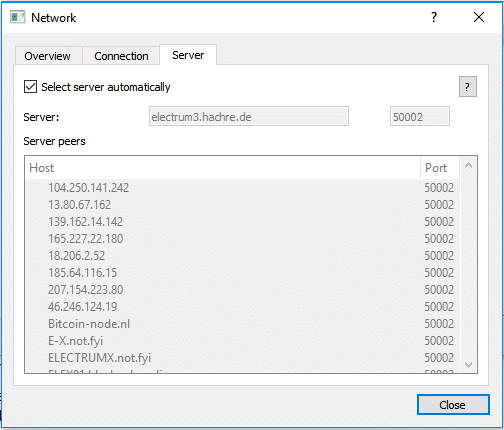 In theory, you could even create your own Electrum server too – if you were really concerned about redundancies. If you have software that you’re willing to put potentially very valuable assets into – you want to know it’s trustworthy. And if you’re an advanced user, you may feel inclined to dig into how it all works. The transparent nature of Electrum makes this possible. Allowing you to trust it. You can find the full source on GitHub. This is also the place for Bug Reports. Simply create a new wallet on your offline machine as you would any other. Once created, go to Wallet and then click “Information.” You’ll be given your Master Public Key, which you can transfer to your online machines in whatever fashion you like. Whether you want to open your wallet on your pc in the privacy of your home, your pc at work or your laptop on-the-go, you can get full access to your wallet. 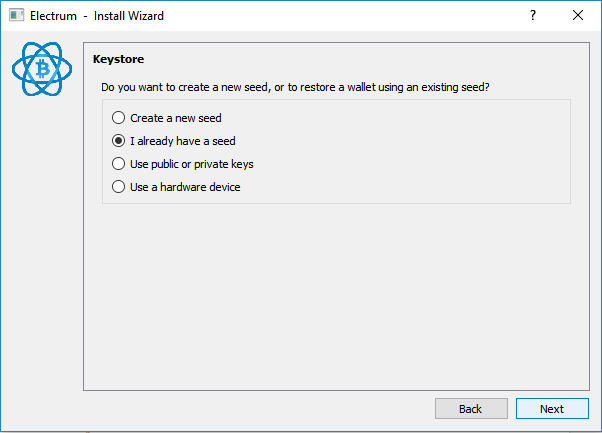 Simply restore it on the other machines using your seed and your wallet will be there ready to go. Considering you don’t need the full blockchain on each device to use your wallet, this makes it a far easier choice over other wallet alternatives. Electrum lacks importing wallet.dat functionality. This is because of how it works as a lightweight client, so it’s hard to count this against it. However, it is significant enough to be worth mentioning – despite the sweep workaround mentioned above. 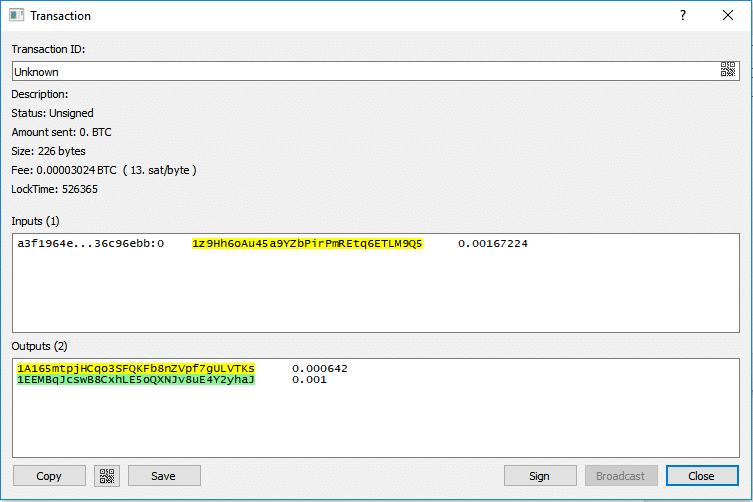 Compared to some of the other wallet GUIs available, Electrum is very basic. Which is great, considering it’s a lightweight client. However, it would be nice to see some kind of flair added to it. Efficiency doesn’t have to look like Windows 95 anymore. As with anything still in development, you’re going to run into some issues. However, some of the bugs can be incredibly annoying. Like pressing the “Address” button when sweeping keys without anything in the field results in an immediate crashing of the client. The upside of this is that the reported bugs get fixed very quickly if possible. So what was a hindrance one week can quickly be solved the next. That’s one of the awesome parts about being an open source project with a very active development team. No Electrum wallet review would be complete without a little quick start Electrum guide. We’ll show you just how easy it is to go from no wallet to an Electrum wallet. In just a few minutes. 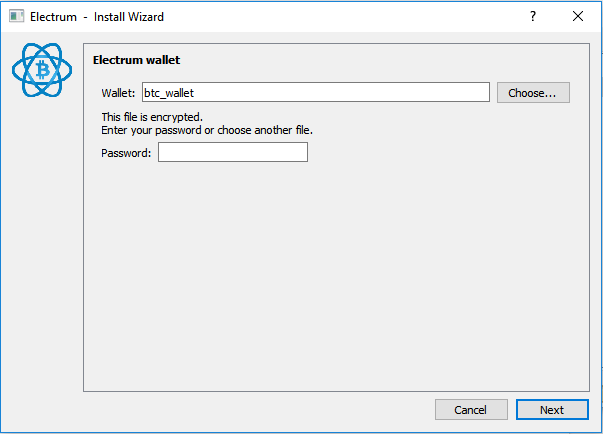 Electrum is one of the original Bitcoin lightweight wallets. It has been around since 2011. But the source its based on is not used solely for Bitcoin any more. So, no matter what you’re planning to use it for – you have to ensure you’re picking the right project. Please note, Bitcoin Gold is currently a beta software and may be unstable! As no Electrum wallet project currently exists for one of the most popular coins of the year, we felt it necessary to include an alternative for Ethereum. It is not based on Electrum code and is not affiliated with the project in any way. 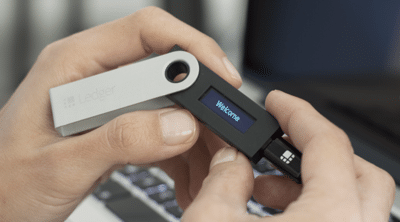 Note: Hardware wallets such as the Trezor and Ledger Nano S provide support for even more coins. This step depends on your operating system. However, the simplest method is to simply download the standalone application for your corresponding OS. For example’s sake, we’ll be proceeding with a basic overview of how it is used and configured on a Windows machine. 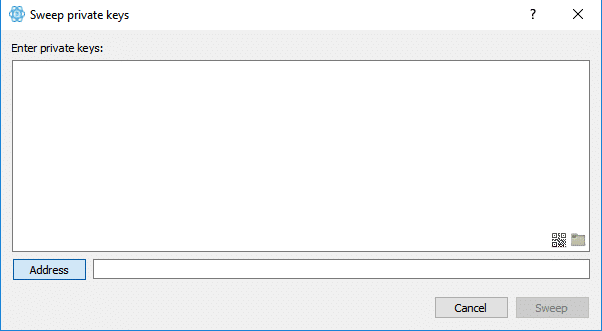 Using the Standalone Executable available from the website’s downloads section. Once downloaded, it’s ready to go. It’s that simple. Once opened, you’ll be faced with a screen very similar to this. At this point, all you have to do is give your wallet a name. What you name it is up to you, but as long as it’s memorable – it will not change how the software or your use of it operates in any manner. So, feel free to be creative! For most people on this step, you’ll simply be creating a new wallet. You can proceed with “Standard wallet” selected and have absolutely no issues whatsoever. This is a wallet that uses a third party server (TrustedCoin) to add an extra layer of security to accessing your wallet and conducting transactions with the contents of said wallets. You can read more about how it works on Electrum’s guide to 2FA. You will be paying a small fee atop each interaction with the wallet for this extra security. A multisig wallet is a wallet that requires a cosigner to use any of the funds within the wallet. These wallets have to be made at the same time. 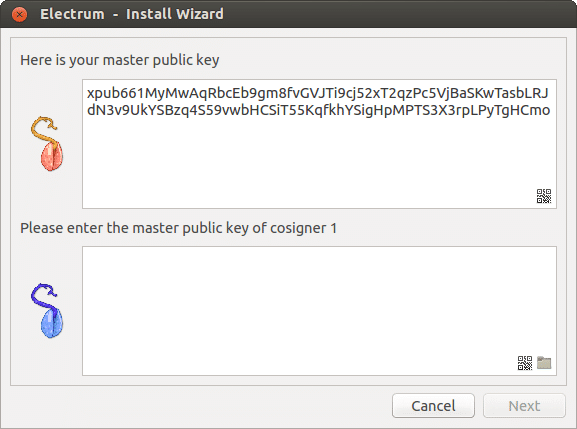 You will be given a master public key on each wallet, you’ll enter these master public keys into the corresponding boxes to create the wallet(s). Once created, nothing will be able to happen within either wallet without the other wallet cosigning it. This is great for security purposes or for joint ventures – although many people recommend not sharing access to funds unless absolutely necessary. If you want to learn more about how multisigs work, you can read the multisig guide. 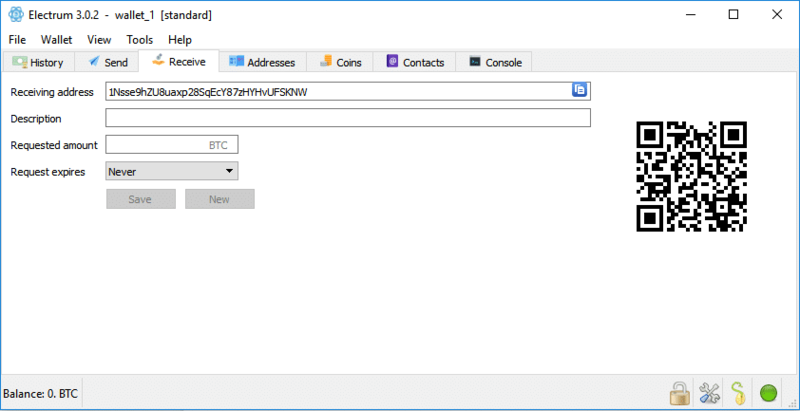 This is a wallet created by using the “import Bitcoin private keys” option. It can only receive coins. The wallet will not be able to spend them. This is useful if you want to keep track of cold wallets or simply be able to check the balance of a wallet set up on a heavy client. Once there, you’ll simply enter your wallet’s seed (that will have been given upon creation) into the box given. It will then recreate the wallet on your local machine, granting you access back to it. 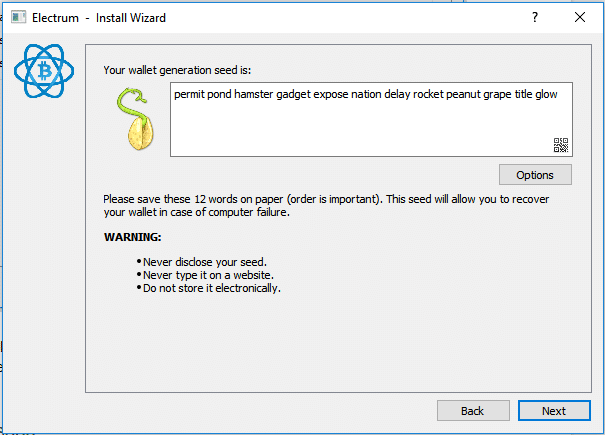 When creating your wallet, you’ll be given a seed. It is incredibly important that you back this string of words up somewhere. Securely and away from prying eyes. An example of a seed string created by Electrum. The best place for this is generally on a piece of paper. Then stored somewhere secure, such as a safe or bank deposit box. Remember, this is access to your crypto assets and should be taken as seriously as the money you plan to put into it. This is a password that’ll be asked for whenever you load up Electrum and try to access the wallet. Ensure it’s memorable and secure. While the option to skip this step is available, it is strongly recommended that you do set a password, as security can never be too tight! Once you’ve created your wallet, the main GUI for Electrum should open. At that point, you’ll be presented with a potentially overwhelming interface filled with a bunch of different tabs and information. None of it is much use without coins in your wallet though. Let’s have a walkthrough using Bitcoin. So, navigate over to the tab that says “Receive.” Once there you’ll have a field titled “Receiving Address,” this is the address you’ll want to give to whatever service you’re receiving your Bitcoin from. By default, the QR code available will simply input your receiving address into the destination field for whoever uses it. However, you can enter a requested amount as well which will update the QR code to fill in the destination address and amount when used. Navigate over to the “Send” tab and you’ll be faced with a very similar form. This is all pretty self-explanatory. Enter the address you want to pay and the amount. You can also use “zbar” to scan QR codes to enter the details that way. Then you’ll be faced with the transaction fee portion of the form to complete. In our example we are using Bitcoin. Electrum is very handy here. As its dynamic fees allow you to simply drag the sliding bar for the optimal ‘recommended’ fee to use based on the size of the transaction. 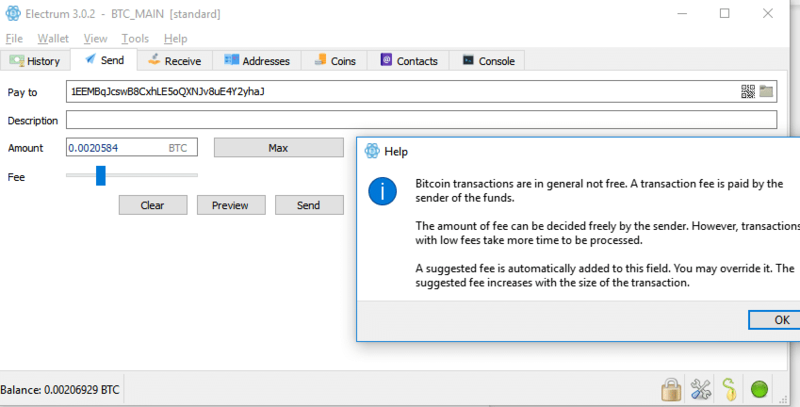 For the novice user, you can trust that this fee is correct to get your transaction completed promptly. Previewing your transaction is a good way to know the fee you’ll be paying. Confirm the destination address is correct and that everything is in order before you hit that send button. Then go ahead and hit send. You’ll be prompted to enter your wallet password, then the transaction will be signed and your coins will begin their process of being sent to their destination address you specified. Once you hit sign, your transaction needs to be completed on the blockchain. The amount of time this takes depends on a number of factors, but the most influential factor for you is how high of a fee you put on the transaction. The higher the fee, the faster miners will get it completed. However, while your transaction is waiting to be completed – it’ll appear as an unconfirmed transaction in your history. If you double-click on this transaction, you can see the amount of time before it’s expected to be confirmed. You can see here the expected confirmation time is 10 blocks. The current average mining time of a single block is 9.23 minutes for Bitcoin. – that means this transaction is expected to take around 90 minutes to confirm. Once confirmed, that’s it. You’re all done. You’ve set up your wallet, sent and received payments. You’re officially set up to use Electrum as your cryptocurrency wallet. Quite frankly, Electrum is awesome for what it is. If you want a lightweight wallet packed with every feature you could need, this is the most reliable, robust and actively developed option there is available. They’ve been around since 2011 and they don’t seem to be going anywhere anytime soon. Overall, we’d say that Electrum comes highly recommended. If you’re looking for something even more secure (but at a price, more than worth it for peace of mind) then you should check out the hardware wallets such as the Trezor and Ledger Nano S.
Do you think we missed something off our Electrum wallet review? Or have a question pertaining to crypto, wallets or Electrum specifically? Let us know in the comments below. We’re happy to help wherever we can. Previous article CEX.io Exchange Review – Is it safe in 2019? 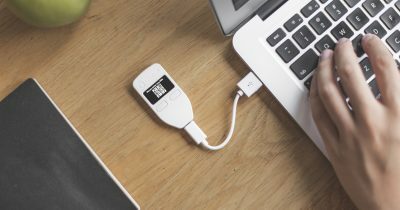 Trezor Hardware Wallet Review – How Does it Work?